Geography is an interesting subject which covers land (lithosphere), water (hydrosphere) and air (atmosphere). Hope you have gone through our easy-to-learn notes covering important land features. Now let’s see how to learn fast the concepts associated with hydrosphere. Let’s start from ocean floor first. We know that our earth is the only planet in the solar system which has water in abundance; hence, it is often called as ‘water planet’. About 71% of the earth’s surface is covered by water (3/5th of Northern Hemisphere and 4/5th of Southern Hemisphere is covered by water). Similar to the continental landforms which have been discussed in previous articles, oceans also contain a variety of landforms. 30+ mock tests are published in the ClearIAS mock test platform. There are mountains, basins, plateaus, ridges, canyons and trenches beneath the ocean water too. These relief features found on the ocean floor are called Submarine Relief. There is no clear or well-defined line separating oceans from the continent. In fact, continents do not end abruptly at the shoreline. They slope seaward from coast to a point where the slope becomes very steep. This shallow submerged extension of the continent is called as the Continental Shelf. The depth usually ranges from 120 to 370 meters from the surface water. Their width also varies from a few kilometers to more than 100 kilometers. Continental shelves are much narrow or absent in some continents, particularly where Fold Mountains run parallel or close to the coast. The shallow water over the shelf enables sunlight to penetrate through the water to the bottom and encourages the growth of microscopic plants and animals called planktons, which are the food for fishes. Continental Shelves are of greater importance to man. They are the sources of fishes, minerals including sand and gravel, etc. A large quantity of world’s petroleum and natural gas are obtained from the shelves. 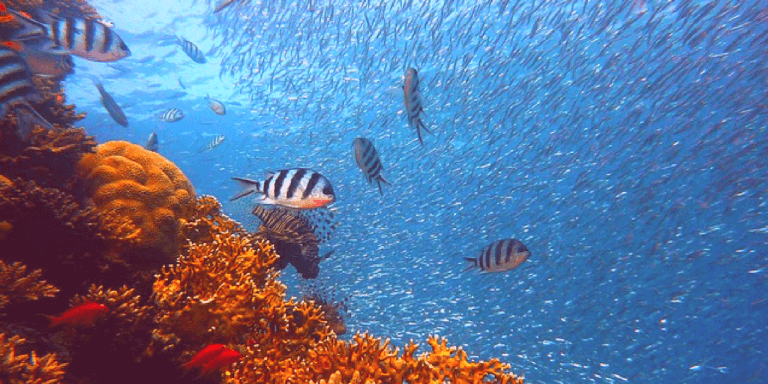 Coral reefs are also common on continental shelves. One of the striking features of the continental shelf is the presence of submarine canyons which extend to the continental slope. These canyons are ‘steep-sided valleys’ cut into the floor of the seas. One of the reasons for the formation of the submarine canyon is the underwater landslide. The continental shelf is generally considered to be territorial water extents of the nations to which it adjoins. 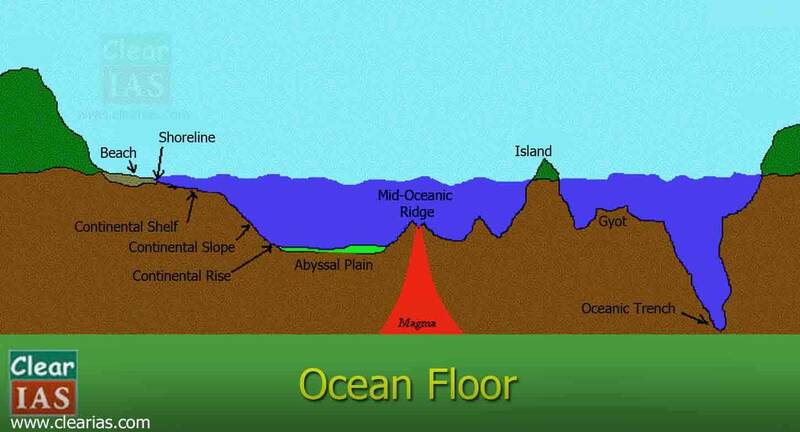 The continuous sloping portion of the continental margin, seaward of the continental shelf and extending down to the deep sea floor of the abyssal plain, is known as Continental Slope. It extends between the depths of 180m to 3600m. They have very little deposits of sediments on them due to their steepness and increasing distance from the land. Sea life is also far less here than on the shelf. The base of the continental slope will have deposits of sediments. This belt of sedimentary deposits forms the Continental Rise. Abyssal plains are the extremely flat and featureless plains of the deep ocean floor. Abyssal plains are considered as the levelest areas on the earth. They cover a major portion of the ocean floors between the depths of 3000m to 6000m. Abyssal plains are as irregular as the continental plains with submarine plateaus, hills, guyots, and seamounts. The floor of the abyssal plain is covered by sediments. The sediments which are formed from the remains of living things are called Oozes. Oozes can be seen in those seas which favour an abundant growth of organisms. Another type of sediments is red clay which is of volcanic origin or made up of tiny particles brought by wind and rivers. 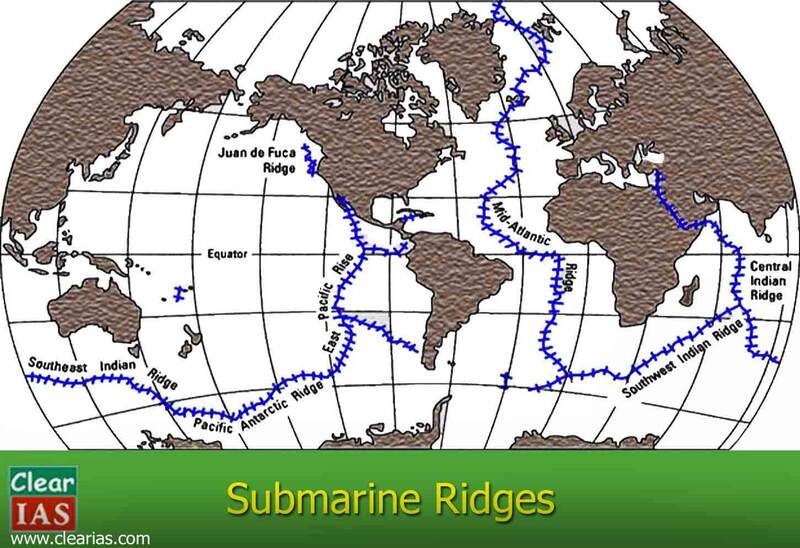 The oceanic mountains are called as submarine ridges. They are linear belts occurring near the middle of the oceans and are also called mid-oceanic ridges. The oceanic ridge is the site of frequent earthquakes. Volcanism is common in ocean ridges and it produces many relief features. The Mid-Atlantic Ridge is the largest continuous submerged mountain ridge which runs from north to south in the Atlantic Ocean. At some places, the peaks rise above the sea surface to form Islands. Submerged volcanoes with sharp tops are called as seamounts. Sometimes they rise above the sea as isolated islands. Hawaii and Tahiti Islands are such exposed tops of volcanoes. Seamounts with a flattened top are called as Guyots or Tablemounts. The ocean deeps are the deepest part of the ocean. They are generally called submarine trenches. These trenches are not always located in the middle of the ocean basins. They may be very close or parallel to the continents bordered by Fold Mountains. They are usually found adjacent to the areas of volcanic and earthquake activity. Great earthquakes and tsunamis are born in them. The Pacific Ocean has the largest number of trenches. The Mariana trench in the Pacific Ocean is the deepest known part of the world. Nice platform to get knowledge of which we sometime do not care of. very useful…specially images helped me to practically visualize the content..thank you sir.. Interesting to read. Thanks for providing us with this platform of knowledge gaining. Thank you soo much sir for providing us with such interesting and reliable notes. You are providing a great help to non coaching aspirants. Can you please upload art and culture notes if your time allows.